The 12th Annual Oak Street Po-Boy Festival will take place Sunday November 11 from 10 a.m. to 6 p.m. on historic Oak Street in the Carrollton neighborhood of Uptown. The beloved annual festival celebrates New Orleans’ favorite sandwich with four stages of music and more than 35 local po-boy vendors. The Oak Street Merchants, Residents and Property Owners (OSMRPO) also announced that Jared Zeller, founder and producer of the annual Mid-City Bayou Boogaloo, will produce the 2018 Oak Street Po-Boy Festival. 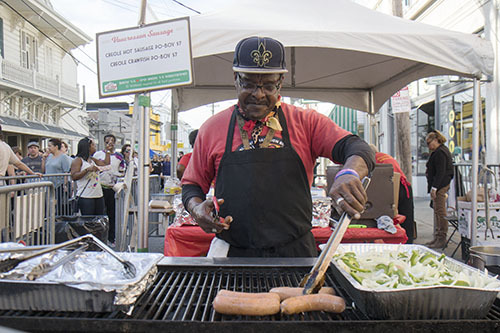 Each year, more than 30,000 people attend the festival, which takes place on Oak Street between Carrollton Avenue and Leake Avenue/River Road. The free festival will once again offset the cost of security and infrastructure by selling $5 wristbands that will allow the purchase of po-boys. Wristbands can be purchased at the festival. The festival benefits OSMRPO and Son of a Saint, a 501(c)3 non-profit which exists to enhance the lives of fatherless boys through mentorship, emotional support, development of life skills, exposure to constructive experiences and formation of positive, lasting peer-to-peer relationships. The festival is still accepting applications from food vendors and any bands interested in performing. Applications and more information can be found at https://www.poboyfest.com. The Oak Street Merchants, Residents and Property Owners’ mission is to improve living and business conditions in an area of the City of New Orleans known as the Oak Street neighborhood, assist the City of New Orleans in maintaining the Oak Street neighborhood in such a way as to enhance the quality of life of residents, merchants, and visitors, and provide assistance to other organizations that engage in charitable activities that benefit the community at large.